Crafty, Scrappy, Happy: Make your own knobs for your furniture. Make your own knobs for your furniture. I am excited to show you another little project that I made that day. 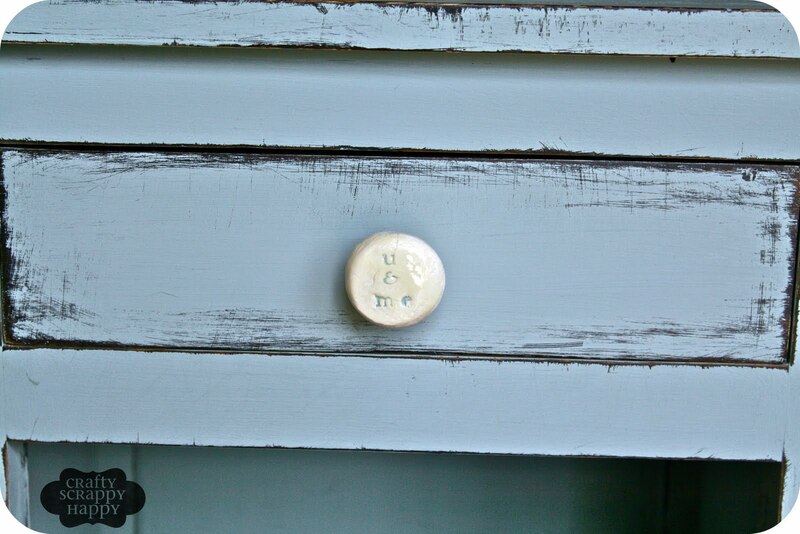 I may have mislead you with the title of this post, because really what I did was up-cycled some old knobs with clay. Remember this photo from the last post??!! :o) Yep that is my knob already to the painted point of making it. 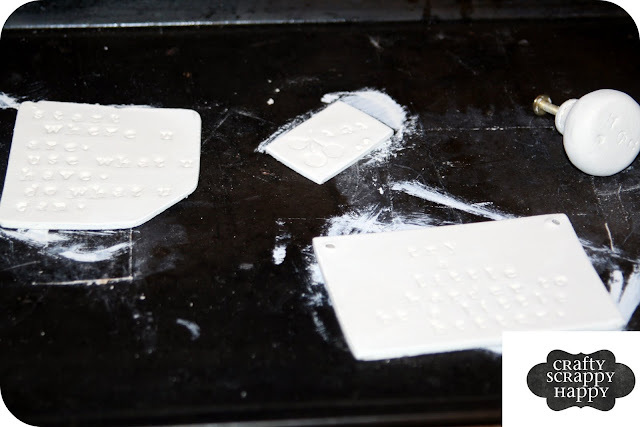 Check out my other post for the actual tutorial on "how to" work with the clay! Much better looking than the original gold-ish colored knob it started out as! 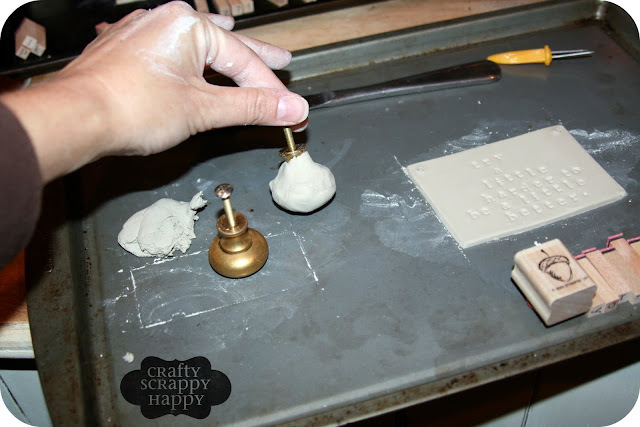 I should explain that I came across a bag-o-knobs at a garage sale a couple of weeks ago and have been wanting to do some fun project with them....starting with clay! I started with the old knob and just formed the clay around it. I tried to work the clay to the edges of where the knob so that it could all be painted and look the same. I just kept working and smoothing and sometimes adding a few drops of water to smooth further. Then I added a glossy top coat. No literally a top coat! 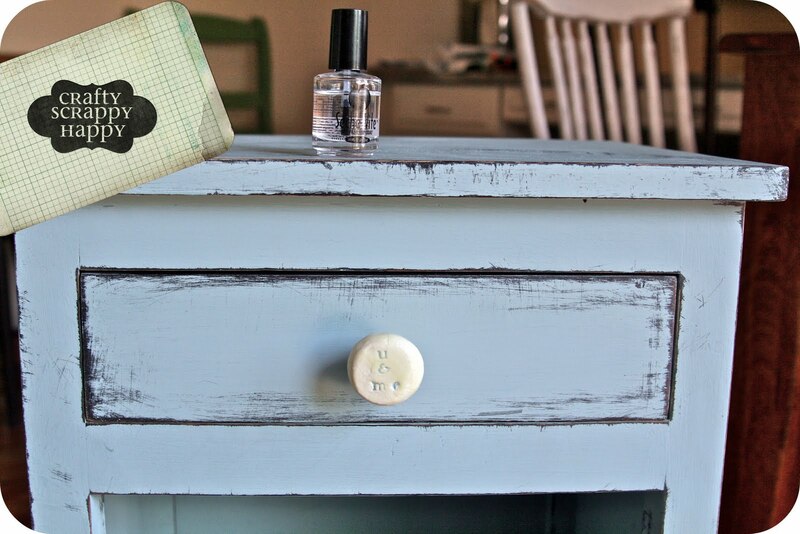 I used some top coat nail polish I had around my house to give the knob a nice shiny finish. What do you think? Kind of a fun way to up-cycle an old looking knob right?? Please please please go and check out my giveaway---it ends on Thursday! Anddddddd get ready to PARTY! Because my crafty party will begin this evening---be sure to come back and check out my last clay project at that time too!!! This is such a great idea! I would have never thought of it! Thanks for sharing! You changed your blog!! It looks great! Can't wait to have you link this up--this amazing! I am so impressed by your creativity! Thank you so much for sharing it on my link party! This is such a clever idea - I love how it turned out! I'm a rubber stamper with a huge stash of stamps...my mind is full of ideas... Thanks for the inspiration! So stinkin' cute! I've pinned this and will definitely be trying it. I have a bunch of little stamps around too that I am excited to use again! Thanks again for linking up to The Creative Spark and all of your weekly inspiration - just love all of your ideas!! I think this idea is fantastic! They turned out so cute! Love your idea! Can't wait to try it in my daughter's room! I love that! 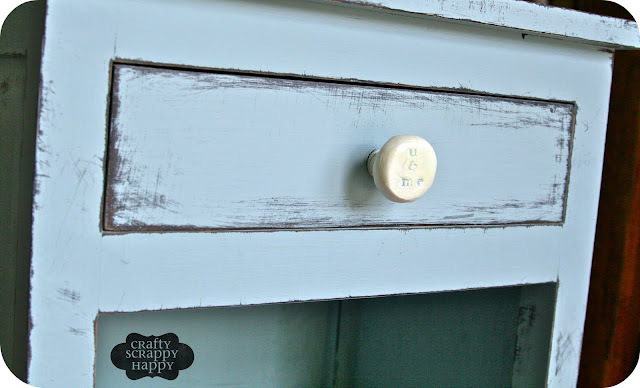 What a fun way to personalize knobs! Great job! Thanks for linking up with us at Show & Share! Love the knob! What a great idea and fabulous transformation!! The new color on the night stand is super cute too. What a great up-cycle! I think everything is so much better with a little personalization. This is such a creative way to do that! Love them. Just wanted to let you know that I featured this today! Congrats! Grab a button if you'd like! I'll be featuring your project tomorrow during STICKER TIME! Feel free to come over and button up! What a neat idea! So cool!